The market crashed on Monday for a number of different reasons. The Dow fell more than 500 points intraday and the Nasdaq was down -197 points at its low. The indexes rebounded slightly but still finished with major losses of -335 and -137 respectively. The decline was blamed on a weekend tweetstorm, Facebook's privacy problem, continued tradewar worries, fears the Fed will raise its posture towards future rate hikes, etc. I am sure no one headline was to blame but a combination of them all. This is also quarter end and portfolio managers restructure portfolios to reduce positions in stocks that have run up and rebalance allocations between stocks and bonds. Having the headline storm accelerated those moves. In the Option Investor commentary over the weekend, I detailed a massive sale of 4.5 million shares of the SPY ETF in the last two minutes of trading. I theorized at the time that somebody could be setting up for a major headline that would tank the market. The SPY declined $4 on Monday so anyone shorting those shares at the close on Monday is already very profitable. Do they cash out or let it ride and risk a rebound? If the market suddenly rebounded at the open on Tuesday, that would make a great short squeeze as they try to cover that many shares. I am assuming it was a short entry because nobody in their right mind would try to sell a 4.5 million share position at 2 min before the close on a Friday. That is just speculation. Fortunately, the market fundamentals have not changed and Q1 earnings are still expected to grow by 18%. Stock buybacks and dividends will increase. Reality should return to the market and it should return to its highs before the Q1 earnings. The keyword in that sentence is "should." There are never any guarantees and the market does not have to be logical. The S&P dipped back to 2,700 before rebounding 18 points to close with a loss of -39. While that was a decent rebound it was not convincing. In fact, despite the major market decline, volume st 6.9 billion shares was just slightly over the average of 6.6 billion shares over the last two weeks, with the exception of expiration Friday at 9.6 billion. That is hardly what you would call capitulation volume or even conviction volume. Decliners were 4:1 over advancers. That is strong but well below the 8:1 or even 10:1 we normally see in capitulation events. This means either there is more selling ahead as we slowly tick lower to retest the February lows or the bears do not have enough conviction to force a continued decline. There are buyers out there but they appear to be waiting for the Fed before they come back into the market. The Tuesday before a Fed announcement is typically positive. However, this is not a typical market. 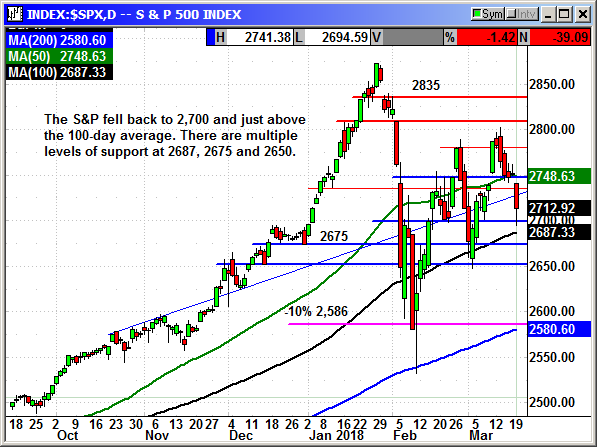 If the S&P moves lower the 100-day average at 2,687 would be the next support below 2,700 followed by 2,675 and 2,650. That is four levels of converging support that could halt the decline. If disaster strikes again the 200-day average at 2,580 is now the 10% correction level if we are going to retest the February lows. 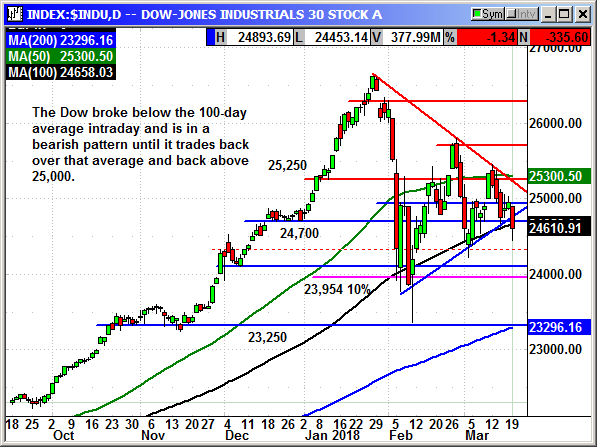 The Dow broke below the 100-day average and the chart is bearish until it trades back above 25,000 to return to neutral and back over 25,300 to turn bullish again. 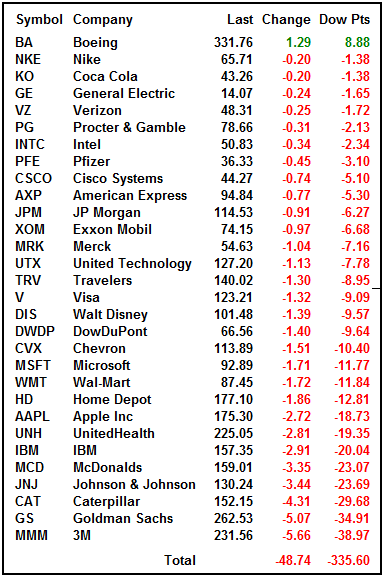 The Dow remains the weakest index because of the international big caps that could be subject to tariff retaliation. Despite the -197 point intraday decline the Nasdaq remains the strongest index. 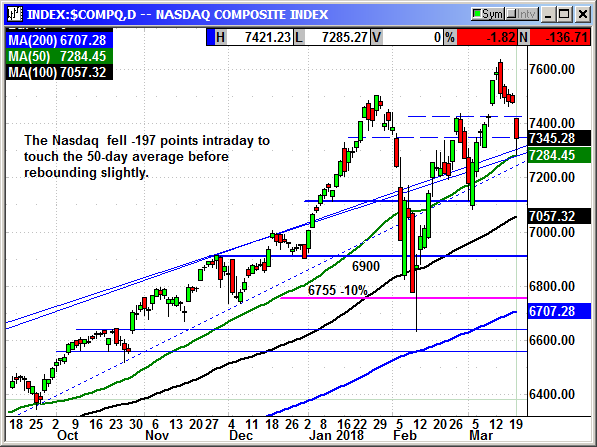 The Nasdaq dipped to the 50-day average intraday and rebounded sharply to regain about 60 points. 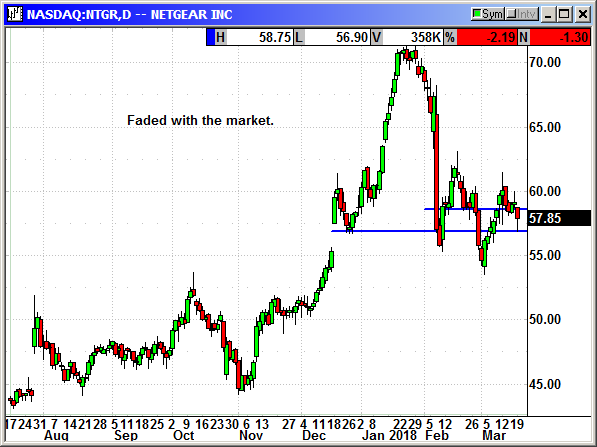 That still left us with a major decline but it also remains in the top portion of the chart. 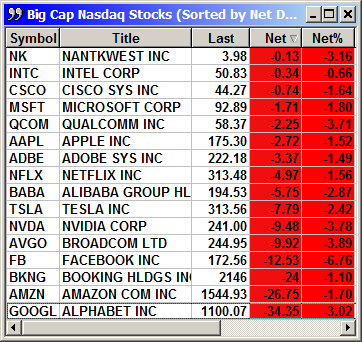 The big cap tech stocks were all negative with six largest all down significantly. This appears to be normal end of quarter profit taking triggered by the headline storm. 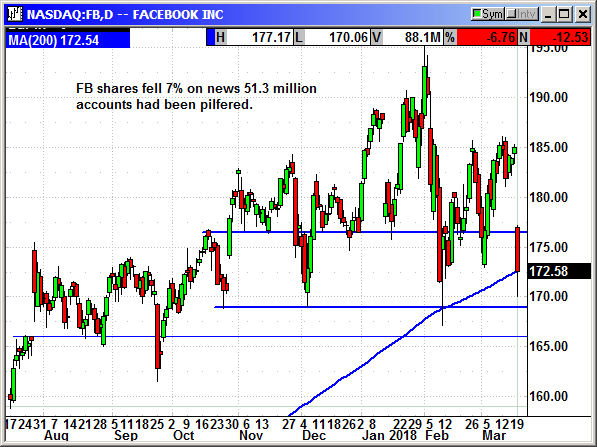 The tech index would have to fall below 7,100, a -245 point decline from here to turn bearish. The Russell 20000 had the strongest rebound with a 17-point jump off the lows ro regain more than 50% of its intraday loss. 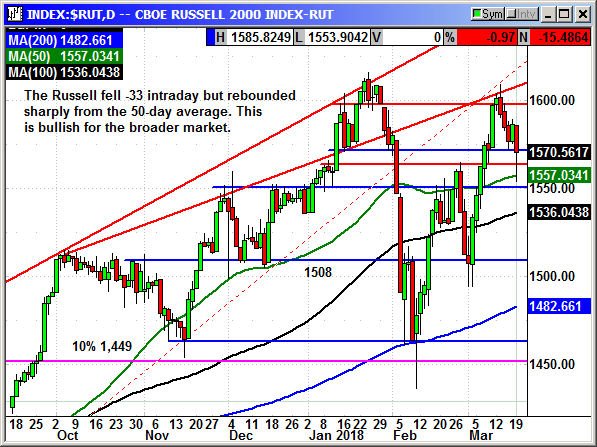 The Russell is the second strongest index but it needs to move over 1,600 to actually revert back to bullish. 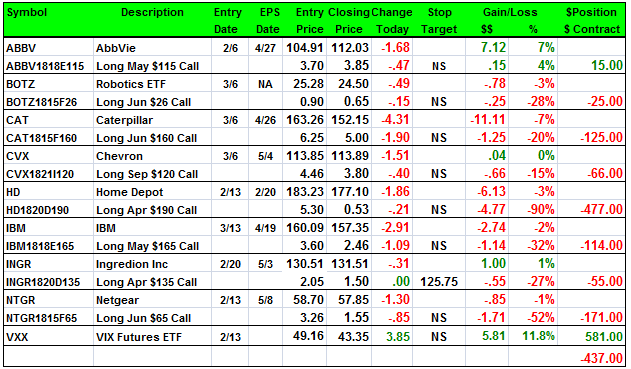 There is not much on the earnings calendar other than FedEx on Tuesday. 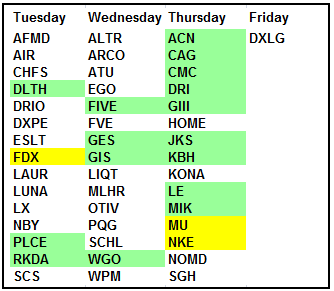 Micron and Nike finish off the week on Thursday. 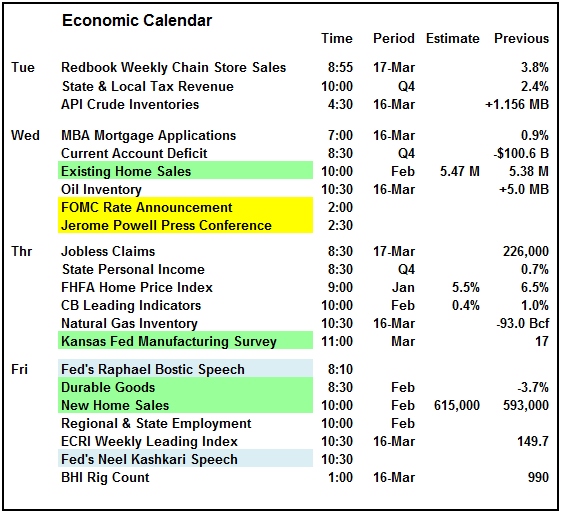 The economic calendar is lacking any material reports for Tuesday and the headliner for the week if the Fed rate announcement and the Powell press conference. There are some analysts who believe Powell will be dovish in his comments in order to pacify the market. There are others who believe he could be a bit more hawkish to let the market do the Fed's work by walking up rates. I am in the dovish camp. The Fed needs the market to recover in order for the wealth effect to continue. If the market tanks and consumers pull back on their spending then the Fed would be restricted on their stimulus reduction program. It all works together and despite their commentary, the Fed needs the market to rise to support their reduction of QE. It is all related. Maybe I am looking at the future through rose-colored glasses of 18% earnings growth and I can't see the obvious correction in progress. 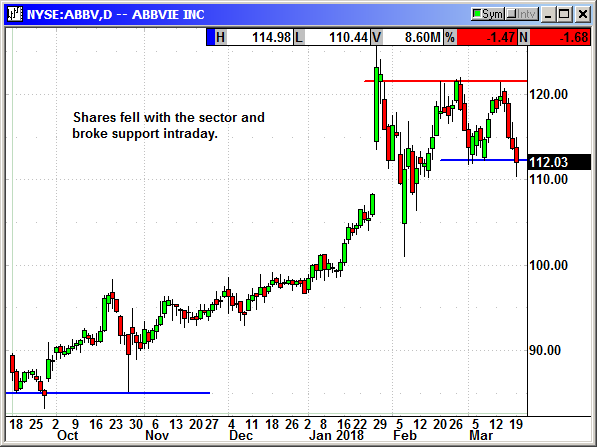 I believe we should buy the dips on a selective basis using solid growth stocks. This is not a value market. We know the Dow can move up 500 points intraday just as easy as it moved down. 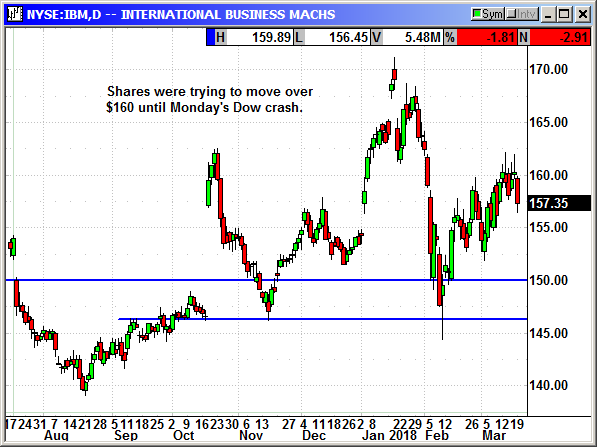 Keep the faith but keep some cash on hand in case we get a better buying opportunity. Buy June $180 call, currently $7.65, no initial stop loss. Sell short June $200 call, currently $2.10, no initial stop loss. Net debit $5.55, maximum gain $14.45. Sell short June $150 put, currently $3.10, no initial stop loss. Net debit $4.55, unlimited upside. No specific news. Shares fell back to support on a -1.7% decline in the sector. 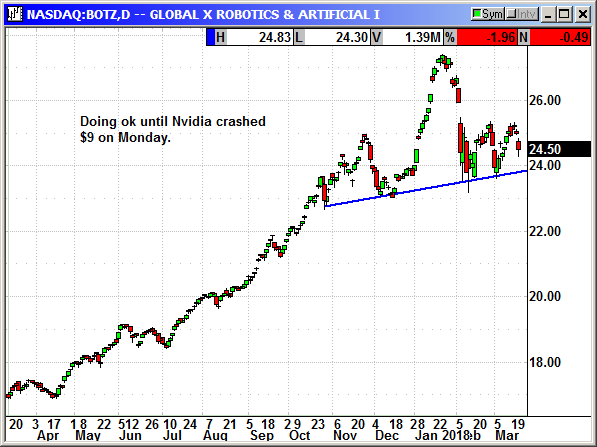 BOTZ was doing ok in a weak market over the last several days until Nvidia crashed over $9 on Monday to knock 50 cents off the ETF. Relatively speaking, shares are holding up well. 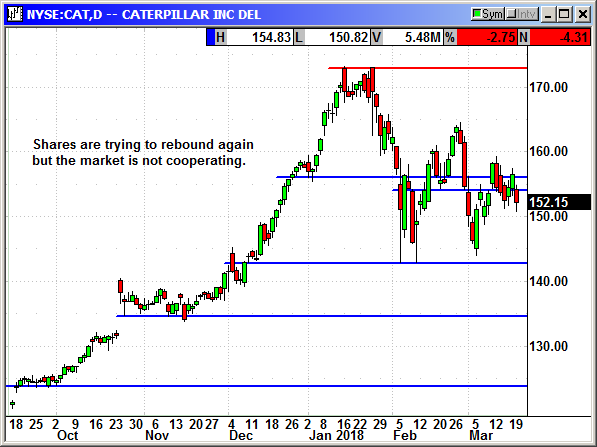 CAT was trying to rebound from the tariff woes and actually closed back over support on Friday. That recovery was short lived with a $4.31 drop in an ugly market on Monday. No specific news. Shares are getting pushed around by the market. No specific news. HD shares are suffering with the Dow. 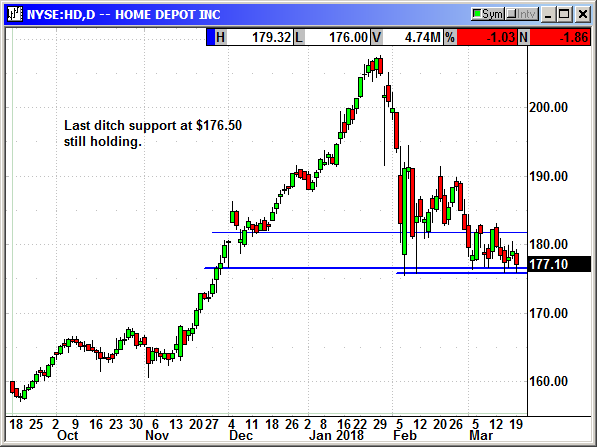 Support at $176.50 is holding but another day like Monday and we could see a breakdown. At 50 cents for the option, there is no reason to exit. 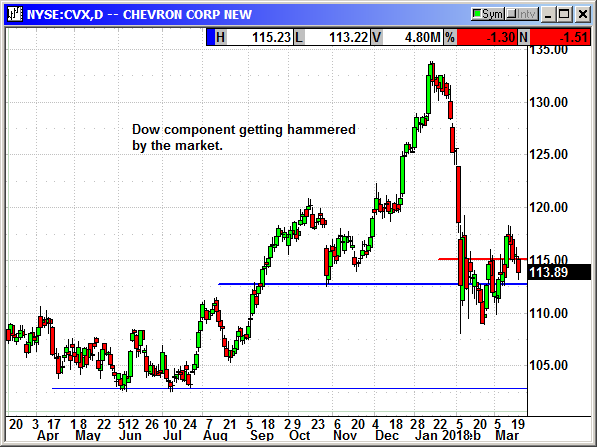 If support holds and the Dow rebounds we could see it inflate quickly. No specific news. Shares were going ok until today. The crashing Dow pulled everything down with it. IBM will display a new computer at the IBM Think Conference this week. It is the size of a grain of salt, has 1 million transistors, is powered by light and has an LED to communicate. It costs 10 cents to make. IBM said it can be used in logistics to track anything and verify the items are legitimate. Counterfeit items would not have the chip because the chip could not be counterfeited. No specific news. 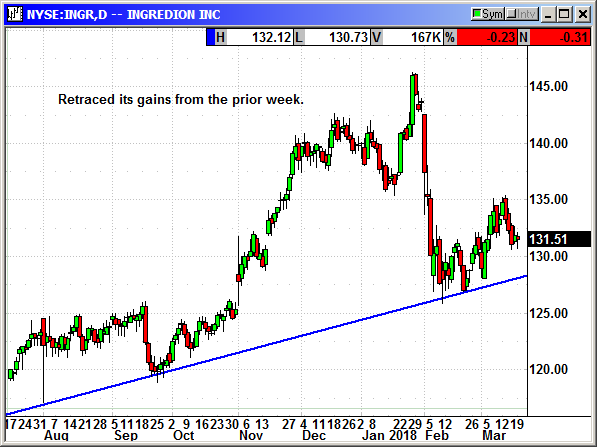 INGR faded with the market last week. Good relative strength today. Volatility declined last week despite the negative market. Monday's rebound was on the 500 point intraday drop in the Dow. It normally takes 4-5 weeks for volatility to return to normal after a high volatility event and we could have a couple weeks left. 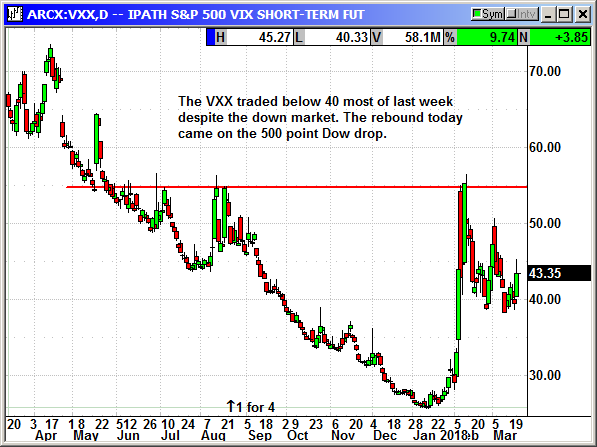 The VXX always moves lower.